Dolly Jewellers offers an extensive selection of jewellery, including engagement and wedding rings, chains, bracelets, earrings, religious jewellery, as well as special gifts that will fit most tastes and budgets. We carry Unoaerre, a fine line of imported Italian gold, available in 10kt, 14kt and 18kt. For those with a more eclectic taste, a large selection of estate and vintage jewellery is also available. Our in-house design staff is always available to assist you in creating your own perfect custom piece. As an authorized Seiko dealer, we are pleased to offer a 3-year warranty with every watch sold. Many other fine quality items and collectibles are available at Dolly Jewellers, including brand name pre-owned watches, coins, lithographs and collectible porcelain figurines. We invite you to visit our store and view our full collection. Our knowledgeable staff will be pleased to assist you in finding that special piece that’s right for you. We carry a large selection of chain and bracelet styles in both yellow and white gold as well as in sterling silver. Our most popular styles include curb, box, wheat, rope, link, figaro, diamond, and cable. Chains and bracelets are available in a variety of lengths and gauges. We have many different styles and designs of sterling silver bracelets and bangles. We also have a selection of medic alert and ID bracelets in both gold and in sterling silver. We have a great selection of rings available including engagement rings, wedding bands, and rings with a wide variety of gemstones. In addition, we also carry large and unique selection of rings in our estate showcases. Here you will find beautiful and ornate designs from the past that will satisfy even the most eclectic of tastes! We are an authorized Seiko dealer, and carry a wonderful selection of watches for every occasion. As a Seiko dealer, we carry Rotary, Pulsar, Lorus, and of course Seiko watches. All of our new watches come with a 3-year warranty. We also carry a selection of estate watches that change on a regular basis. Here you will find some beautiful and unique time pieces that have been restored, serviced, and are ready to wear. Included in this selection are a number of vintage pocket watches! We have many different styles and sizes available of gold earrings for every occasion! Popular styles include hoops, studs, sleepers, and drops. We have a large selection of diamond and pearl studs of various sizes. We also have a selection of sterling silver earrings available. We have a wide range of pendants available in gold as well as in sterling silver. We have all types, categories, and themes, including initials as well as pendants with gemstones. We always have a large selection of religious pendants in stock! 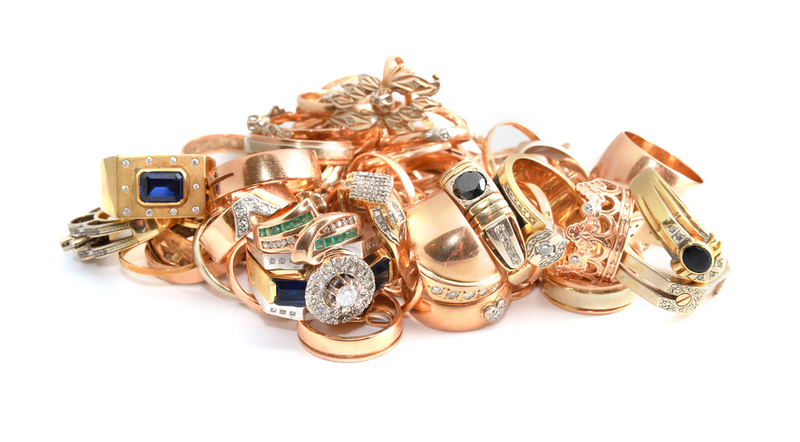 We have an extensive collection of estate jewellery for sale that includes 9kt, 10kt, 14kt, and 18kt pieces. You will find rings, earrings, bracelets, watches, pendants, and antique sterling silver items. We have a large variety of items with different gemstones for every unique taste. You are more than welcome to come and try something on or learn more about a particular item. Our estate merchandise is constantly changing, so make sure to check it out the next time your are in! If there is something in particular that you are looking for, we are happy to look for that special item that you are trying to find! We carry the full Hagerty Jewellery Cleaning line as well as Selwyt Jewellery Cloths. The products we carry include gold and silver jewellery cleaners, silver polish, silverware dip, cleaning clothes, and polishing sprays. We have gold and silver of various weights available for purchase. If you are looking for a particular gold or silver coin, we may have exactly what you’re looking for. If you have been on the hunt for a particular coin for your collection or to give as a gift, feel free to inquire! We carry a wide selection of new pre-1970 Doulton figurines, including ladies, men, characters, toby jugs, and miniatures. If you are looking for a particular name or model, feel free to call us, or stop on by to see these beautiful figurines in person. If you are looking for vintage sports cards, look no further. We have a large selection of vintage cards from all major sports, including PSA and BVG graded cards. Feel free to inquire if you are looking for something specific! We have most Royal Canadian Mint products available for purchase from current and previous years. We also have a large inventory of older releases including popular items such as 1976 and 1988 Olympic Coins, Silver Dollar Proofs, Year Sets, and unique Commemorative Issues. We have a variety of old paper money available, in addition to old coins. Our paper money spans the 19th and 20th centuries, and includes notes from most major releases from the Canadian Government. We have a selection of unique pre-confederation notes, as well as a selection of foreign notes available.